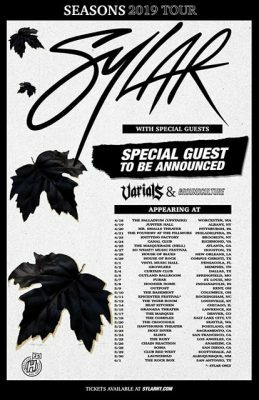 Attila, Ice Nine Kills, Sylar, and Mushroomhead have announced multiple tours! First up Attila, which is dropping a brand new album entitled, Villain on February 22nd, will kick off their tour dates with four album release shows starting on February 20th and finishing up on February 23th. With those shows wrapped up they join up with All That Remains, Escape The Fate and more to go on a co-headlining tour kicking off on February 28th and concluding April 6th. Check out all the dates below. Next up is horror inspired band, Ice Nine Kills. They hit the road on the March Into Madness tour starting on March 27th with From Ashes To New, Palisades, Afterlife and Hawk with this tour wrapping up on April 18th. Shortly after that they join Falling In Reverse, From Ashes To New and New Years Day to hit the road starting on April 20th and finishing up on May 24th. Be sure to check out their latest album The Silver Scream. You can see all the tour dates below. New York’s Sylar is set to hit the road on a headlining tour in support of their latest album, Seasons. The Seasons tour kicks off on April 18th and finishes up on June 1st. They will be joined by an unknown special guest, Varials and GroundCulture. You can see all the tour dates below. Last but certainly not least Mushroomhead is set to hit the road on the Madness & Mayhem Tour. They will be joined by Hellzapoppin, Ventana, and Worldwide Panic. The tour kicks off on February 15th and concludes on March 17th. You can see all the tour dates below.